It is a clinical approach utilizing skilled, specific hands-on mobilizing techniques to diagnose and treat soft tissues. Why do we feel tension in our pelvic floor? The pelvic floor is susceptible to negative tension and holding patterns for many reasons. Posture, poor seating, holding patterns, emotional holding due to stress, childbirth damage, history of constipation or any bowel disorders or history of urinary tract infections. There may be no history of any of the above but just a genetically tight pelvic floor. Strengthening an already tense or tight pelvic floor can be counterproductive and can increase rather than relieve symptoms or can mean that regular pelvic floor exercises just don’t work. 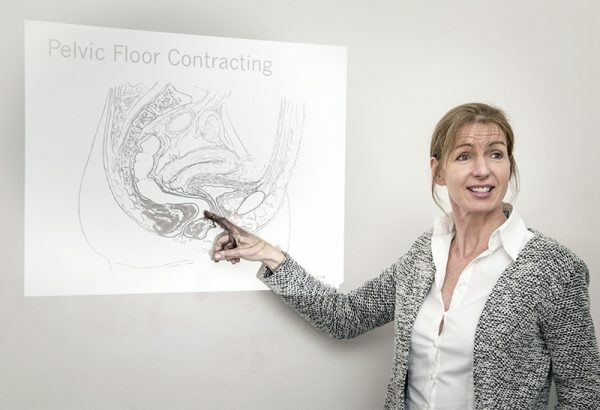 Pelvic floor manual therapy is a series of internal and external soft tissue release techniques to address unwanted tension in the pelvic floor muscles and fascia. There should be a sense of relief having had the pelvic floor mobilised that results either immediately or over time in an increased range of movement in the muscles and fascia. This in turn should result in an increased ability to either contract or release muscles improving timing in the muscles and pelvic organ position. There may be some initial discomfort at the time of mobilisation in the same way that one would feel it with back or neck mobilisation but this improves quickly at the time of treatment with the specific techniques. There should not be any post treatment soreness. The contractility of the pelvic floor can be seen to change on realtime ultrasound following a session of manual therapy. Include stretching and trigger point treatment where a muscle is tense. Those techniques should not be so painful that a patient reacts by tensing up and there should be no treatment soreness afterwards.